Just as tap water can vary by location, the content of bottled water varies by bottler. Some of the highest quality bottled water is produced by reverse osmosis (RO) filtration, which typically reduces impurities by 95% or more. Many municipalities treat water with chlorine to kill bacteria. A few even soften water. But their goal is to only meet minimum federal requirements. To eliminate chlorine aftertaste and common water problems, an in home water treatment system is often necessary. Treated water is hard water that has been softened. Water is hard when it contains minerals such as magnesium and calcium. If you have hard water, you may see staining on your sinks, tubs, showers and clothing; build-up on your glassware; and damage due to scale in your pipes and appliances. You may also notice less lather from your shampoo and soap and a filmy feeling on your skin. Hard water can produce a rock-like scale that builds up in the pipes, dishwashers, water heaters, ice machines and other appliances. This scale can also reduce water flow and clog valves and vents to create maintenance problems and reduce service life. Water is softened or conditioned by replacing hard ions such as magnesium and calcium with softer sodium or potassium ions. 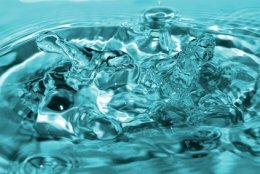 Water softeners must be regenerated regularly with brine solution, renewing their ability to remove hardness from water. The first step to improving your family’s water is to identify your specific problem. Are there reddish-brown iron stains in your sink, shower or tub? Does your bathtub have a hard water ring? Does your water look dirty or cloudy? Does it smell sometimes? For these and other common problems, Golden Gate Well Drilling/Ecowater Naples can conduct in-home tests and recommend the perfect solution.